The Kii Peninsula points south away from Kyoto and Osaka and is one of the most remote and mystical areas of Japan, despite its proximity to these great cities. On the Kii Peninsula are the three Grand Shrines of Kumano, pilgrimage destinations for successive emperors and their families from Kyoto since the 11th century. 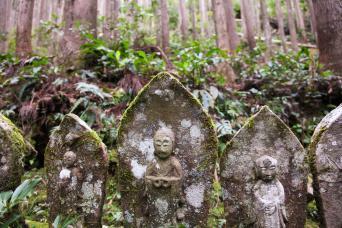 There were several pilgrimage trails including the Nakahechi-do, Kohechi-do and Ohechi-do, collectively known as the Kumano Kodo ('Old Road of Kumano'). Our walk focuses on both the Nakahechi-do and Kohechi-do, weaving through forested mountains and small villages first towards the Grand Shrine of Hongu and then onwards to the mountain-top temple complex of Mount Koya. This tour features two nights in the picturesque hot-spring village of Yunomine Onsen part-way along the trail. We offer two optional hikes for this extra day in addition to unique cultural experiences, such as walking with a Yamabushi ascetic monk, create your own traditional Japanese paper or undertaking a spiritual meditation session. Spend a leisurely second night in the picturesque hot-spring village of Yunomine Onsen or Kawayu Onsen part-way along the trail. On this extra day we offer two different optional walks on new sections of the trail, which can be combined if you wish. 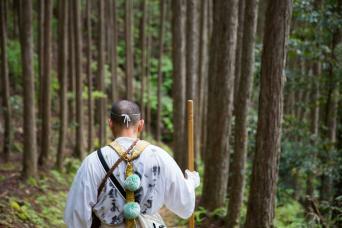 We also offer unique cultural experiences, such as walking with a Yamabushi ascetic monk, making your own traditional Japanese Washi paper or undertaking a spiritual meditation session. Today's shorter optional walk is 1.5 hours (2.8km / 1.7 miles) on the Dainichigoe trail between Yunomine Onsen and Hongu. You can walk both ways, or ride one way by bus. Or combine the Dainichigoe trail with the Akagigoe trail for a satisfying full-day hike. From Yunomine, travel by bus to the start of the Kohechi trail. Your first walk on this ancient route begins at Yagio, following a wonderful forested trail over Hatenashi-toge Pass, with excellent valley views, fascinating cultural monuments (including a miniature Kannon statue pilgrimage) and picturesque villages. A brief bus ride avoids a short final stretch on a busier road at the very end of the walk. Finish the day with a relaxing thermal bath at your inn for tonight in Totsukawa Onsen. Kosenkaku Yoshinoya is a characterful, traditional inn with fine service, excellent local food and relaxing Onsen baths; the outdoor Rotemburo baths offer lovely views over the local river. The inn offers packed snack lunches for the following day on the trail. Heading onwards from Totsukawa Onsen to Nishinaka by local bus, the section of the Kohechi trail to Miuraguchi offers some of the best views of the Kumano valley over the Miura-toge Pass and continues to the scenic, peaceful village of Miuraguchi or ‘Gateway to Miura’ where you stay tonight in an intimate Minshuku family-run guesthouse on a small farm. In the small village of Miuraguchi, Mandokoro has over 300 years of history, with a wonderfully characterful, homely feel. 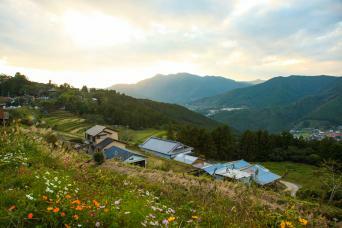 The innkeeper Ikuko-san typifies the warm hospitality common in the Kumano region. She prepares delicious home-cooked meals made using vegetables grown nearby by her son. The inn offers packed snack lunches for the following day on the trail. After breakfast you leave Miuraguchi. The trail continues north along one of the most rural and challenging hikes in the Kumano region over the Obako-toge Pass to another scenic rural village called Omata. The hot-spring village of Nosegawa Onsen is your destination for tonight and is a short scenic riverside walk onwards from Omata. Your inn will pick you up from Omata if you prefer not to walk the last section to Nosegawa Onsen. Nosegawa provides a comfortable stay with large relaxing Onsen baths, spacious rooms and delicious, locally-sourced meals. The inn offers packed snack lunches for the following day on the trail. Leave Nosegawa Onsen this morning and begin todays hike from the boundary between Nosegawa and Koya - it is also possible to walk the full distance from Nosegawa Onsen if you prefer a longer hike with some strenuous paved sections. On the final leg of the Kohechi trail to Mount Koya there are magical valley views as you traverse the peak Mizu-ga-mine. Arriving at the mountain-top temple town at the end of the walk delivers a great sense of achievement. Spiritual Mount Koya is a fitting reward for completing the pilgrimage route. With a grand history, this Buddhist monastery is where the priest Shinran stayed in the 12th century, carving his famous wooden statue of Amida Buddha. It has a beautiful rock and moss garden by one of Japan’s most famous garden designers, Mirei Shigemori. Panasonic founder Konosuke Matsushita wrote his last books while staying here too. The Shukubo provides wonderful meals in the Shojin Ryori Buddhist vegan style, and offers the opportunity to participate in the the moving O-tsutome chanting ceremony early in the morning. On your final day, you have chance to explore more of Mount Koya, visiting the atmospheric Okunoin cemetery with thousands of graves and memorials to feudal lords and other past luminaries, and other monuments. 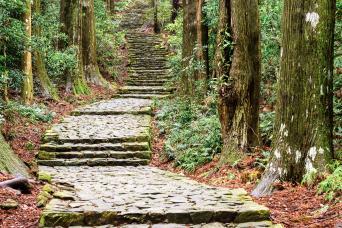 Or undertake our optional, challenging hike on the Choishi Michi trail, the atmospheric original approach to Mount Koya lined with stone markers. Finally board the scenic Nankai railway line towards Osaka and Kyoto.